In the final installment of Lessons from the Saddle, re-posted five years later, I discuss how to open your riding to a world of possibility by blending psychological openness and mechanical preparation. It’s amazing how far the bike industry has come over the last 5 years, ‘gravel grinder’ bikes now featured in most companies’ catalogs. Since spending countless kilometers on Grand Bois’ original 32mm tires, we have recently become big fans of their (now ‘Compass’) newer Extra Leger options, from 26mm up to 38, with a new tubeless 35 now available. Meanwhile, mainstream brands are playing catch-up, releasing similar high volume, high quality tires, and even building bikes around them (Cannondale Slate). Call it what you will, an expansive approach to cycling is alive and well! Keep an eye here for upcoming posts on choosing ‘gravel’ bikes and high volume tires. In the last Lessons from the Saddle piece, I contrasted two approaches to cycling, one ends-oriented and another means-oriented. When one has a particular end in mind, lets say an outcome, the bicycle factors as a tool to enable pursuit of that end. 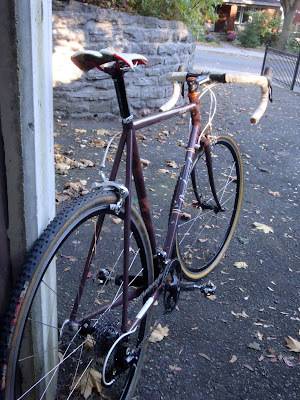 A cyclocross race bike is a good example. Outcome: podium at the local cross race on Sunday. Most efficient and effective tool for the job: lightweight dedicated cross frame (no bottle cage bosses) and fork shod with high end components, tubulars, razor thin saddle, as little bar tape as possible, one chainring. Great tool. It took at least four years of hammering as a teenager to acknowledge the centring rightness of my cycling practice. I was on a local trail, pounding away as a always did, having ridden 30k from home already. Approaching a familiar lookout I never stopped at, I had a novel thought: why not stop and take it in, pause, think, breath, just enjoy where I am for a few minutes. I stopped, sat down on the bench, and looked around. I took it all it. I think this was a turning point, a moment where I finally came to really appreciate nature for what it is, wonderful and awe-inspiring. My ride, which had been unfolding according to a clear plan, had been cracked, and into that opening bled possibility. I didn’t have to form a plan and stick to it to the letter. I could adapt on the fly, make up my mind as I went, stop when I felt like it. I didn’t have to go, go, go. I didn’t have to ‘know’ what was going to happen. Fast forward about 15 years (ed. it’s been 20 now!). This past season I did a bit more road riding alone than previous years, often nipping out for rides up around Wakefield solo. My Steelwool Secteur 18 is designed with possibility in mind: big tires, low gearing, fender mounts, bottle cages (naturally). I’ve ridden this bike on trails I’d have never considered on previous road bikes with skinny tires. Sure, I’ve been known to dent a rim or two here and there, but the joy or riding a road bike just about wherever I want minimizes the pain associated with rebuilding wheels prematurely. But its no coincidence that I have a bike suited to all-road riding; this is according to plan. The conditions of possibility for possibility rides fall into two categories: the machine and the body, in no particular order. If I were to rank these, I’d place the body first, naturally, as no bicycle, no matter the delicate curves of its lugs, gorgeous chrome, impeccable cable routing or supple tires, will compensate for a body unfit for the challenges of the road. Fitness supports adventure. Better to let daylight and family obligations dictate one’s timeline, rather than one’s ailing body. If you fancy adventure by bike, treat yourself right and make time to ride. The machine. It must be specced for possibility, but within what range? This is a matter of preference. One man’s adventure bike might be an mtb, another a randonnee bike. This often comes down to locality. For example, in and around Deerfield, Massachussetts, home of D2R2, some of the locals I’ve ridden with tell me dirt road riding is the absolute best kind of riding the area has to offer, eclipsing mtb or straight road. Their bikes are build accordingly. In Pemberton, BC, mtb riding beats all, and a great bike is one that travels up and down with equal poise, handling plenty of rocks and a mix of soil types. Practical, real world bikes, don’t constrain possibility, the open the world to it. Good bikes encourage their owners to ride all the time, not just on perfect summer days. They call to us, they say, ‘Hey, I’m ready, lets get out there!’ This isn’t to say that we all need the same kind of bike, and its an all-road. I am saying that road bikes marketed to beginner level riders that mimic PRO bikes are a step in the wrong direction. When a bike tells you, ‘Hey, I’m a road bike, don’t take me off smooth roads because I’m not designed for that,’ it implicitly tells you what road riding is not: namely riding off the beaten track. But it is. It is riding on the beaten track, off the beaten track, and off off the beaten track. It is, and can be, whatever we want it to be. If I had a dime for every time someone told me how much the wished they had a bike to ride around the roads surrounding their cottage…if only their road bike’s tires weren’t so skinny. Its vital to note that racing bikes don’t need to be so unlike all-rounders as one might think. Sure, carbon wonder bikes are aero, light, stiff, and all that. Some are really good. I have one, its a Specialized Roubaix, and its terrific (ed. Now my one carbon bike is about as full-on road as they come: Cervelo S5). But I just had my best cycling season of my life on nothing but steel bikes: 3rd place in the OBC Almonte Roubaix on my Steelwool Secteur 18 with 30c Grand Bois. 2nd place at the Mont Tremblant Canada Cup XC on my Niner 853 steel hardtail. 2nd overall in the Eastern Ontario Cyclocross series on my Steelwool Truffle Pig (and most of the series was raced on my Secteur with caliper brakes!). Of all these bikes, only one was raced differently than I’d ride it, the Truffle Pig, with its tubulars. 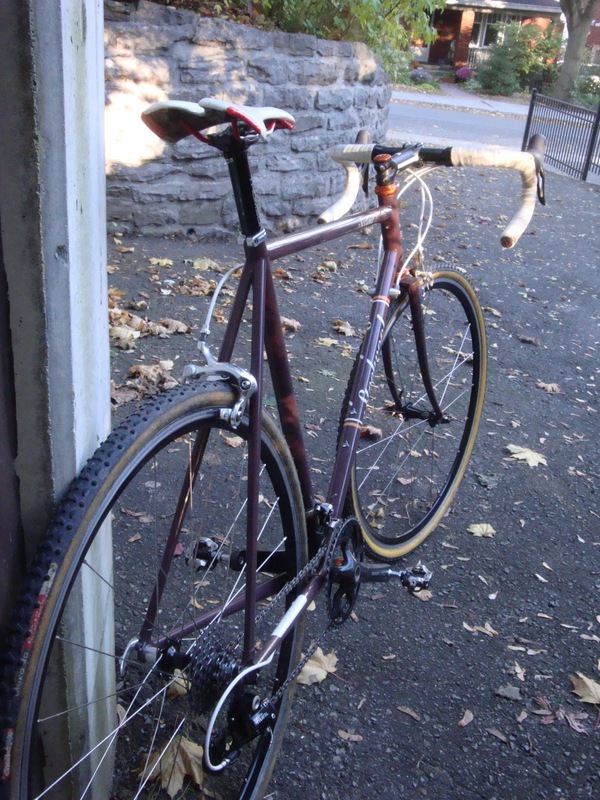 My Secteur was raced in the same trim as I use to thrash trails, ride backroads, and the Parkway. The same. My mtb was set up the same as I ride all the time in the Park and anywhere else. 120mm travel up front, a low knob tire in the back, and a good aggressive tire up front. I wouldn’t change anything for a full-day choose-your-own-adventure ride. So great bikes, bikes that can do it all really can do it all. With judicious specification of their design and components, they can both serve as catalysts of possibility, and companions in the heat of battle. What’s left beyond an able body and bike? What other planning is required to support a possibility ride? Just the basic stuff, knowing how to conduct typical repairs in the field, carrying spares like a master link, patches, tire boots, a bit of tape, a tube, tools and pump. Depends on how far out there you want to get. For a 200k day pretty out there, I carry all I need in a medium sized seat bag. Except food, that’s jammed into my pockets. Pack lots, and don’t forget your money and bank card. Maps don’t hurt, and a cell phone is always wise. We’ve come to know the depanneurs in our area pretty well;valuable intelligence. So that sums it up; plan for possibility by covering your bases and let your path unfold in front of you. You won’t regret it.